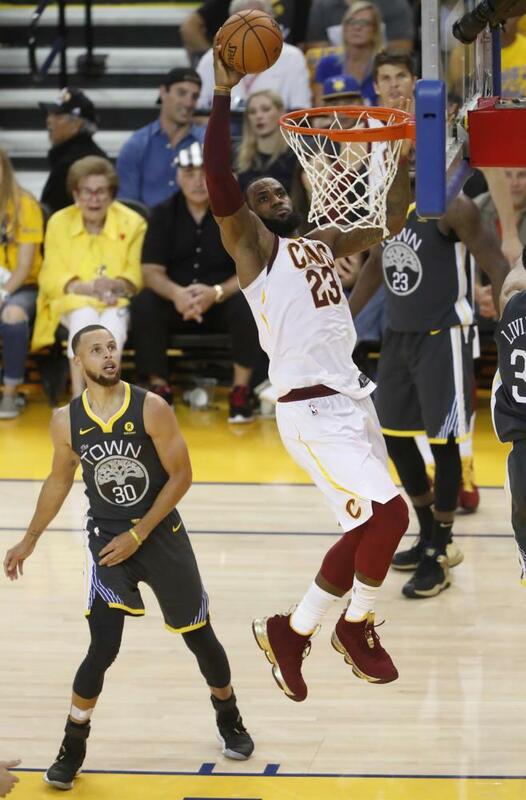 The Golden State Warriors followed up their thrilling overtime victory in game one of the NBA Finals with a more dominant result in game two Sunday night, trouncing the Cleveland Cavaliers 122-103 with help from a record-setting performance by two-time MVP point guard Stephen Curry. The basket seemed to be as wide as an ocean for Curry, who routinely made deep, acrobatic shots throughout the night en route to an NBA Finals-record nine three-pointers. Those makes accounted for 27 of Curry’s game-leading 33 points. Now with the series at 2-0 in favor of Golden State, the Warriors are just two wins away from solidifying their modern NBA dynasty. A series win would be the team’s third title in four years — a feat that could finally overshadow the individual greatness of LeBron James. If the Cavaliers want to pull off the upset, James’ supporting cast needs to step up in games three and four. The inability and ineptitude of his much-maligned teammates was on full display in game one of the finals, when George Hill missed a go-ahead free throw with four seconds left and J.R. Smith dribbled the clock out after the ensuing rebound. James’ jittery teammates will certainly benefit from playing in front of a supportive home crowd, making it plausible that Cleveland steals at least one game at home. But other than that, it’s hard to envision a situation in which Golden State doesn’t take home the Larry O’Brien Championship Trophy. After all, this is a Warriors team that topped the Cavaliers in 2015 and set the record for most regular-season wins in 2016 — all before the addition of perennial All-Star forward Kevin Durant. Since his addition, Golden State became a force that has not yet been stopped, and it would take a team with far more starpower to slow them down. At this juncture, the Cavaliers just don’t have that sort of starpower. Sure, James will go down as one of the greatest players to ever play. But he’s never won a championship without at least two all-stars. And after the Kyrie Irving trade, his next best sidekick has been Kevin Love — a five-time NBA All-Star whose injuries have relegated him to the role of three-point shooter and defensive liability. Teams who have taken a 2-0 series lead in the NBA playoffs have a 282-20 record, or 93.5 percent win percentage, meaning the Warriors can all but smell statistical victory in their future. But 0-2 deficits involving James have been a different story. James has faced eight such deficits throughout his career and managed to emerge victorious in three of those series, giving his team far better odds than history would otherwise suggest. Within those three comebacks lies a matchup precedent — the Cavaliers beat the Warriors in the 2016 NBA Finals after losing the first two games. But there’s also a recency precedent — the Cavs overcame an 0-2 deficit to the Boston Celtics just two weeks ago in the Eastern Conference Finals. And with the series heading back to Cleveland, it should be noted that the Cavaliers play far better at home than away. They’ve averaged 105.8 points per game playing in front of their home fans this playoff season, compared to 98.7 on the road. James especially has shown a willingness to concede road games in order to show up in a big way at home, where he averages almost seven more points per game. But the Warriors are as dominant as a team as we have ever seen, and their success lies not just in having four all-stars, but rather in the team system that head coach Steve Kerr implemented. They ranked among the top five in nearly every statistic that emphasizes team basketball during the regular season, including fifth in screen assists per game, fourth in passes made per game and first in assists per game. Winning three championships in four years is no small accomplishment — for comparison, the Kobe Bryant-and-Shaquille O’Neal-era Lakers were the most recent team to accomplish that feat in the early 2000s. The mid-2000s Spurs, led by the trifecta of Tim Duncan, Manu Ginobili and Tony Parker, came close, earning three titles in five years. As long as Stephen Curry continues to play at an MVP-level, Draymond Green stuffs the box score, Klay Thompson drains three-pointers on command and Kevin Durant hoists shots over defenders like they’re not even there — none of which are without precedent — the Warriors will win, regardless of James’ most Herculean efforts. Assuming that happens, Golden State’s core trio of Curry, Green and Thompson will then have three championship rings — matching James’ total and shifting the spotlight from James as an all-time great player to the Warriors as an all-time great team.